When I wrote last month about my love of theatre and the fact that I’ve gotten out of the habit of reading plays, relying instead on seeing them, Frances encouraged me to join in on a shared read of The Night of the Iguana. I wasn’t sure I wanted to join in because now that I’m no longer in a book club, I’ve been relishing the reduction of reading commitments. 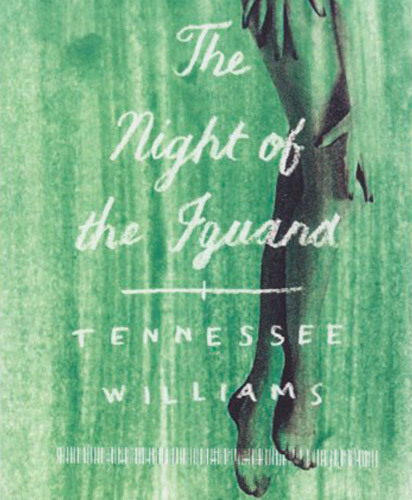 But Tennessee Williams is one of my favorite playwrights, and I hadn’t read or seen this on stage. (I did see the John Huston film several years ago, but my memory of it is vague.) So, in the end, I couldn’t resist. The Night of the Iguana is set on the veranda of a run-down Mexican hotel in 1940. Reverend Shannon, former Episcopal priest and now tour guide, has brought a busload of schoolteachers from a Baptist Female College to the hotel, where he has connections with the owner, the recently widowed Maxine Faulks. Shannon is in hot water this tour group for taking out 16-year-old Charlotte Goodall; Charlotte’s guardian is ready to turn him in to the tour company. As Shannon is trying to convince the ladies to stay, mostly by keeping the bus keys and refusing to take them elsewhere, a 30-something spinster named Hannah Jelkes arrives looking for lodging for her and her grandfather. It turns out that Hannah is in as desperate a state as Shannon. She and her grandfather have been traveling the world together earning money with her watercolors and sketches and his poetry recitations. But multiple minor strokes have left Hannah’s grandfather with memory problems, and they are out of money. I know the difference between loving someone and just sleeping with someone—even I know about that … We’ve both reached a point where we’ve got to settle for something that works for us in our lives—even if it isn’t on the higher kind of level. Maxine has decided that she if can’t have love, she’ll take what she can get, and she’s fine with that. She accepts it. I was young once, Mr. Shannon, but I was one of those people who can be young without ever really having their youth, and not to have your youth when you are young is naturally very disturbing. But I was lucky. My work, this occupational therapy that I gave myself—painting and doing quick character sketches—made me look out of myself, not in, and gradually, at the far end of the tunnel that I was struggling out of I began to see this faint, very faint gray light—the light of the world outside me—and I kept climbing toward it. I had to. It’s interesting that although Hannah seems to have found the healthiest approach to life, she also comes across as the least real of the three main characters. And that makes me wonder how realistic her outlook really is. In choosing endurance and detachment, is she in fact denying her own desires? Has she put them so far from her mind that she doesn’t know what they are? Or has she truly come to a place where fleeting moments of connecting with another soul are sufficient? And are these connections that she prizes really connections? At one point, Hannah describes two isolated moments of love that are to me, and I suspect most readers, decidedly creepy. I can’t decide whether Williams sees them as creepy and Hannah’s reaction as a sign of her dysfunctionality or whether we’re meant to see Hannah’s overly generous reaction to what today would be considered predatory behavior as one of compassion. Her heart seems so pure when she talks of these moments, but the purity could easily be a more troubling naïvete. I can’t help but wonder what might happen to her after her grandfather dies, and she loses the one stable foundation that she has. Williams is a master at creating complex characters with ambiguous motivations. It’s one of the things I’ve loved about all his plays that I’ve read. I can never quite bring myself to like his characters, but I do find them fascinating. The Night of the Iguana was no exception on that score. I’m glad I took the time to join in on the shared read. See the thoughts of other readalongers at Evening All Afternoon, Rhapsody in Books, Caravana de recuerdos, Kiss a Cloud, Nonsuch Book, This Book and I Could Be Friends. I’ve seen the play twice, and I think it works better on stage than it does either in the movie or on the page. The stage Hannahs have been more vulnerable and less beautiful than Deborah Kerr, thus more believable, and the Maxines have been a bit seedier than the luminous Ava Gardner (imagine how Bette Davis must have been as the originator of the role on Broadway!). The staginess of the play, well, it fits better on stage. Richard Burton’s Shannon is limited by his miraculous voice, and he never falls to the depths a stage actor can convey, particularly when the play is done in an intimate theatre. If you have the opportunity to see it staged, by all means try to see it. The sense of oppression that Williams does almost better than anybody can be absolutely crushing in a small venue. Christopher, I would love to see this on stage! I’ve only seen two Williams plays on stage (Glass Menagerie and Cat on a Hot Tin Roof), and I enjoyed them both a great deal. And yes, I can definitely see how Bette Davis would have made a wonderful Maxine–she’s one of my favorite actresses! Hannah’s reaction to the “creepy” moments of love seem less pure given her previous entanglements with the “blue devil.” I’d say yes to the troubling naivete, but even more that she operates on a different level. Her actions seem too controlled, as if acting freely would most surely give her the ticket to breaking down. I was almost afraid for her. Claire, I just couldn’t quite decide how seriously to take Hannah’s talk of her own “blue devil.” I still can’t quite decide if she was able to subdue it because it wasn’t all that serious (although it certainly felt serious to her) or if she had really gotten through some desperate battle with depression. At any rate, I agree that she does seem too deliberate in her self-control, and sometimes very close to cracking. It also occurs to me to wonder about the role of the rum coco in the play. It probably gets more mentions than God! At the very least, it had me wanting one by the end of the play! And oh those rum cocos. Sounds delish! Yay Teresa! So glad you jumped in. Tennessee Williams is one of my favorite playwrights as well, and as I see from visiting the other conversations this morning, it appears that we both weather crazy well. Love how you tap into the theme of desire here as it runs through his other plays as well. What really intrigues me too is the longing that hides behind those desires is never really satisfied by a physical fulfillment of desire. And that translates so well on stage too, doesn’t it? But perhaps no one got this better than Elizabeth Taylor in the film version of Cat on a Hot Tin Roof. My absolute favorite Williams. Looks like we share similar feelings about Hannah and her creep fest sexual experiences too. Still pondering the different possibilities of her purpose in the play. Frances, thanks so much for suggesting I join in! Yes, it does seem like desire is a central theme in Williams’ plays, and these characters certainly aren’t satisfied, even two of them are getting their physical desires met. What they want runs deeper than that. I love Cat on a Hot Tin Roof as well (the KC production several years ago was great! ), but I think my favorite is Streetcar. As I mentioned over at your blog, I’m still irritated with myself for not going to see the KC production with Cate Blanchett last year. I think it’s great when a writer is sufficiently skilled that they can make you invested in characters, even if you don’t particularly care for them. I always find the flawed characters the most interesting! Steph, Some of my favorite books and plays are populated with people I’d never want to know in life! Pretty much all of Williams and Thomas Hardy is like that, but experienced at a distance, such characters can be fascinating. Interesting. Frances described Shannon as “eerie” and you see her as “ethereal and set apart.” Thanks to both of you for elucidating that aspect of her character. I honestly didn’t notice – too distracted by how the larger-than-life characters of Shannon and Maxine. I agree with Claire – her actions do seem too controlled. El Fay, A lot of the ethereal imagery came out of the stage directions for me. At one point, she’s even said to be looking at Shannon like a guardian angel. And her actions often seem really mannered, which goes along with your and Claire’s point about her being too controlled. She’s definitely the character who left me with the most to chew on. I was one of those people who can be young without ever really having their youth, and not to have your youth when you are young is naturally very disturbing. This makes me wonder about the reasons behind Hannah never really getting to have her youth – is she talking about mental illness, about having to take on adult responsibility very young, or about some kind of trauma? That could explain her carefulness, the repression of her own desires – it’s a very illuminating line, I think! I also share your difficulty pinning Williams down on just what he thinks about Hannah’s “love” experiences. I would find them very creepy now, but I somehow resist the assumption that Williams found them creepy then. Or at least, I don’t think he felt that they were intrinsically creepy/predatory. I mean, the Australian asks Hannah if she’ll take off a piece of clothing, and he’s very shy & gentle…presumably if she had said no, he would have apologized & rowed her back to shore? It’s definitely one of those reading situations where I know how I would react, but I don’t know how the author would react. Anyway, I’m so glad that you took Frances up on her plea to read along! Very nice entry. Emily, I thought that line was pretty revealing. Why didn’t she get to have her youth? And does that mean that she missed out on some of the life lessons about, say, sexual boundaries that we’d deem important? And is she really as lucky as she claims? I’m inclined to think that Williams wasn’t thinking of those experiences as predatory but as evidence of Hannah’s ability to have compassion on struggling souls–and it is that, I suppose, but that doesn’t stop me from thinking it’s also creepy. I’ve loved every Tennessee Williams play I’ve ever read and I will have to read this one. Thank you for the marvellous review. Litlove, I’m glad to discover another Williams fan. This was well worth the time. I really need to READ more plays and watch them too. I enjoyed the Tennessee Williams plays I read in high school and college and this sounds quite interesting. I hadn’t heard of it before I saw everyone reading it this week…. Rebecca, Now that I live in a great theatre city and volunteer at two local theatres, I’ve started seeing lots of plays and stopped reading them almost altogether. But I’d really like to get back in the habit of reading them too. Interesting points about the Hannah character, Teresa, esp. regarding the “compassionate” vs. “creepy” way to evaluate one’s response to her two “love affairs.” I didn’t really dwell on that aspect of things when I was reading the play (I saw Hannah and Shannon more as pawns in an art vs. theology statement Williams was trying to make), but I think you’re right to suggest that her portrayal deserves much more thought on the audience’s part to figure out her true role. Thanks for joining in on the discussion and contributing such a nice post! Richard, I hadn’t thought of the art vs theology angle, but that does warrant thinking about. Maybe art gives a person a vehicle to channel passions and thus maintain some semblance of mental and emotional health while theology is about denying or suppressing passions, causing them to explode in destructive ways. And then Maxine is the picture of giving in and taking what you can get. There’s so much to think about here, and I’ve really enjoyed the discussion. I might get in on a couple of others as well!